I couldn't listen to the narrator - I only got to 17:22 when I ran out of patience. The narrator is much to sing-song especially with the male voices. I'd rather read this than listen to this version. 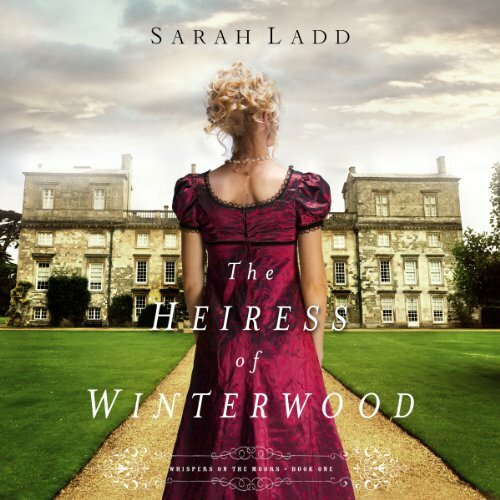 Would you listen to The Heiress of Winterwood again? Why? I loved this story. I wish the recording would have been done by a British actress since the story is set in England. I really enjoyed this story but I believe the narrator was mismatched to it. The narrator has a very good voice, and I think she would sound great in something like a documentary. The book was good enough, and I really liked the relationship with God that weaved throughout it, but the narrator was not my favorite. Would you be willing to try another one of Jackie Schlicher’s performances? NO, NO, NO. First of all, the story is set in England so an English accent should have been used. Secondly, there is some kind noise in the background like crinkling paper or turning pages AND smacking/swallowing almost the entire time. I usually had to keep the bluetooth almost completely out of my ear just to be able to tolerate this mess. Thirdly, there is hardly any distinction at all between different people talking. Story was good, liked the mystery, but the narration ruined it and I stayed annoyed most of the time and didn't enjoy the book hardly at all. I will listen to another book by this author only if the narrator is different. At first, I felt really drawn into this book. It was off to a great start. The second half lost me. I did something I've never done before which was to "skim" through the audio recording just to wrap it up! The first half of the book there seemed to be so much potential for an in-depth relationship to develop between the main characters. Instead, the second half of the book was spent dealing with a kidnapping. I was just bored to tears. Sorry. I really have no interest in reading a sequel. WHY did they have a narrator with an American accent when the book takes place in England??? That was a huge mistake, and made me view the book in an unfriendly manner. The story was okay. Amelia's tenacity to taking care of her slightly known friend's baby, when the woman dies in childbirth, is noteworthy, even if unbelievable. If the baby had been her close friend's child - maaybe........ but a woman she'd only known for a few months? THAT doesn't make sense - unless Amelia had some deep need in her character that she wanted to fill. But this was never discussed or explored. I was glad, though, that her want/need to keep the child let her see the how deeply self-centered and selfish her fiance was. As it always is to me in these type of stories, I was frustrated that both she and the baby's father would never be honest with each other. A little communication would have made a world of difference for both of them. I understand that this is a "plot ploy" to make the novel last longer, but it is such an overused ruse and so trite, that I am always surprised that yet another author has used it. Makes me realize that the author isn't that good, and doesn't have the imagination he/she should. Unique premise with Amelia risking her name and fortune by promising to raise her dying friend's infant child, then proposing to the child's father in order to give the child the best life. This happened early in the book. The romance is sweet but takes a backseat to the rest of the plot, which is actually pretty action-driven for a novel like this one. This is a wonderful story for someone that wants to spend some time in a Regency setting and the story is obviously inspired by Jane Austen. I have no complaints with the narrator, I think she did a fine job. But I have to agree with another reviewer that having a reader with a British accent for a British character/setting may have enhanced this audiobook just a little bit. Overall, a great story and I did enjoy it so much. My first by Sarah Ladd but I'm looking forward to more. Enjoyed it . I'll try more of this author's books. Can't wait to checkout others. A little predictable but generally good. The American narrator reading a book set in Britain was a bit of an issue, though she did do her best, I think she found British accents challenging. Also, she seemed to read rather slowly, extending a 350 page book to nearly 11 hours. Rather too long to listen to in one sitting.